Used 2009 Jeep Wrangler X 4WD AUTO for Sale in Mundelein IL 60060 Premium Auto Sales Inc.
ALL ORIGINAL AND CLEAN WRANGLER X WITH AUTOMATIC TRANSMISSION, A/C, ALLOYS, POWER DOOR LOCKS AND WINDOWS! EYE CATCHING ORANGE EXTERIOR IS CLEAN AND THE PAINT IS SHINY! CARFAX CERTIFIED AND JEEP/CHRYSLER DEALER SERVICED! CALL US TO SCHEDULE A TEST DRIVE! 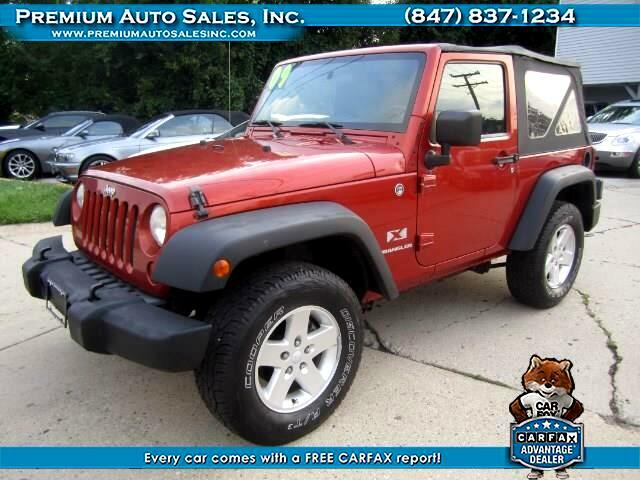 THIS JEEP IS OFFERED WITH 3-MONTH/3,000 MILES POWERTRAIN WARRANTY!